For only $68, You get the most powerful scraper and poster for your link building arsenal! You can tell us your e-mail. If you don't type it, we will send GScraper to your Paypal e-mail. Subscribe to get free version. Why GScraper is best scraper/poster ? GScraper automatically checks if your post was approved after posting. The days of checking which posts actually went live after posting are over. With GScraper, you just post to your scraped targets and it will check that for you providing you with a true Auto-Approve list in the end. Fast and easy. Need more? Unlike other programs which post only blog comments, Gscraper can post to any kind of non authorized form! When harvesting or posting is complete you will be notified via email. I could go on all day about all of the features but I think you will get a better idea if you simply try the free trial of Gscraper here. Scrape based on the type and time! Functions to clean and sort scraped lists! Post to any kind of non authorized form! Easy to find the auto approve list! Expand lists for particular domain! Gscraper is now a staple in my SEO arsenal. I have replaced multiple programs with it. I like its simplicity and how powerful it is. Usually, programs that are easy to use aren’t very powerful. This isn’t the case with Gscraper, it doesn’t sacrifice any power for ease of use. My lists have never looked better. There is no scraping tool out there that can even come close. It's not often that I feel the urge to review a product but there really are some great things to be said about Gscraper. I've been using it for several months now and have to say that it is hands down my favorite link buidling tool. The sheer power of it simply blows my mind at times. In its basic form it's a tool that scrapes urls from Google based on the footprints and keywords you specify and then posts links to them. It also handles a wide variety of other tasks such as list expanding, filtering and checking. Apart from its low one-time purchase cost, the great thing about Gscraper is that you can be up and running in no time. Install it, run it, put in a few footprints (it handles multiple footprints simutaneously), click start and within 10 minutes you will have scraped a few hundred thousand urls to blast your links to. Yes it's that fast! 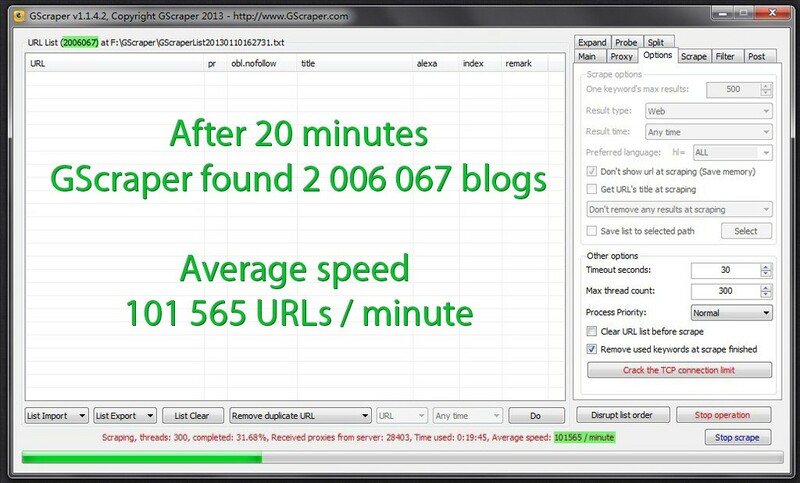 I run it at about 300 threads on my VPS and it scrapes urls at up to 50,000, 60,000, sometimes 70,000 urls per minute! If it seems to slow down then you can switch to any another Google datacenter which will most often make it speed up again. One of the problems a lot of people run into when running SEO software is proxies. Either they don't have enough of them, or they they are scared of burning through their private proxies from too much use, or they simply can't afford enough of them in order to run their software at a fast enough speed. Sure, many programs have proxy scrapers built in that will go out and find public proxies but often by the time you come to use them they are already dead. Besides, scraping for proxies is like watching paint dry. You have no such problems with Gscraper. By subscribing to their proxy service you never need to worry about scraping for proxies, or burning through them, ever again. The program connects right into the Gscraper proxy server which maintains a vast pool of thousands of proxies. For a very reasonable fixed price weekly, monthly or quarterly you have access to unlimited proxies, on demand! Planning on running the software round the clock? No problem! Trust me, the supply of proxies is neverending, on big scrape and post projects I will get through several hundred thousand proxies and they just keep on coming. In this regard, Gscraper is untouchable. Don't want to subscribe? That's no problem either as you can load up your own proxy lists if you want. Gscraper supports Death by Captcha. In all honesty, despite the fact that I have a DBC account I am kind of scared to turn on captcha solving. My fear is that I'll deplete my DBC balance in no time due to the high speed that Gscraper runs. That said, my rate of success without having captcha solving activated is more than acceptable. On a couple of occasions I have had the need to contact support with questions about some of the program features, or due to minor glitches that I have experienced (which eventually turned out to be caused by the settings on my VPS). Responses have always been quick and courteous and my feeling is that the people behind this program act professionally and understand good customer service. Whats more, they seem to be open to feedback and suggestions on how to improve the program. Gscraper is a beast of tool. The appeal for me is the one time payment for the software, the ease of use, the speed at which it completes scrapes and posts, the reasonably priced unlimited proxy service and the committed team of developers behind it. I therefore have no hesitation in recommending it to other serious internet marketers out there. 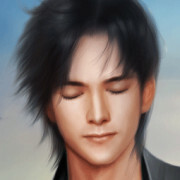 SEM9 is China's largest English SEO BBS, on which someone said GScraper is SEOer nuclear weapons, because he can make scrape and post becomes simple and efficient. Before, I doubt, but used GScraper and I really like submission by GScraper powerful proxies and efficient post. Now GScraper in China has being sell well, also hope it can go towards the world. 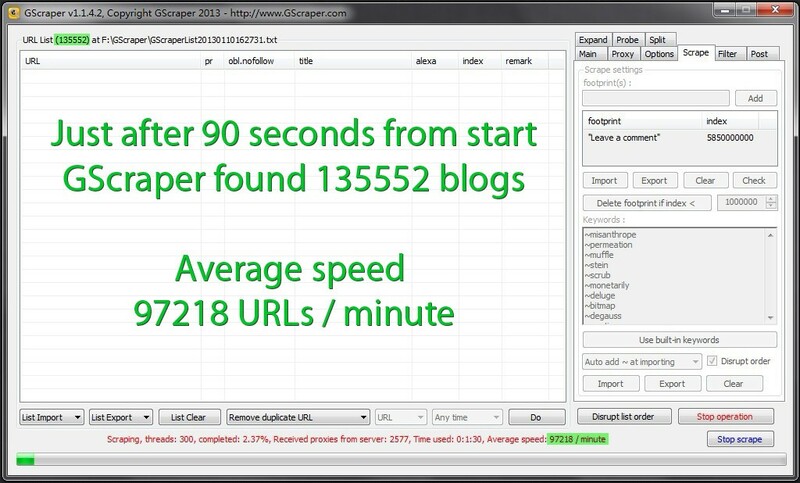 GScraper is fastest Google scraper I even seen. When I start to use it, I forgot about all other Google SERP scrapers / harvesters. With this tool You can find AA lists in hours not days! So I will advice any one to try out this software, as a very fast and easy to learn for begginers. With other products user has to do a lot of additional jobs like: proxy scraping/testing, filtering lists, checking AA, etc. Its time consuming, but GScraper do most of this jobs at once. As I don't belive so much in software advertised as "start and forget", here we have good example. I was spoiled by GScraper so I ask to add "automatic notification" to get notifications on mobile when job is done - and they add this function just after few days. What You can ask more from software and support? Vote 10/10! I have been using Gscraper for all my scraping needs for some time now. It truly has every other tool beat that includes my old favorite scrapebox. I can do EVERYTHING I want with it. If I need a new list I just take maybe 1-3 minutes setting it up in the scraper and press scrape and it wont disappoint me when I check up on it. The best part is the awesome filter tools it has for once the scrape has been completed I can do anything from clear low PR pages to clear out pages containing certain words or urls containing certain words! This tool is for the professional list builder who wants quality relevant link sources. Simple interface, with built-in proxies which let scrape become very simple. 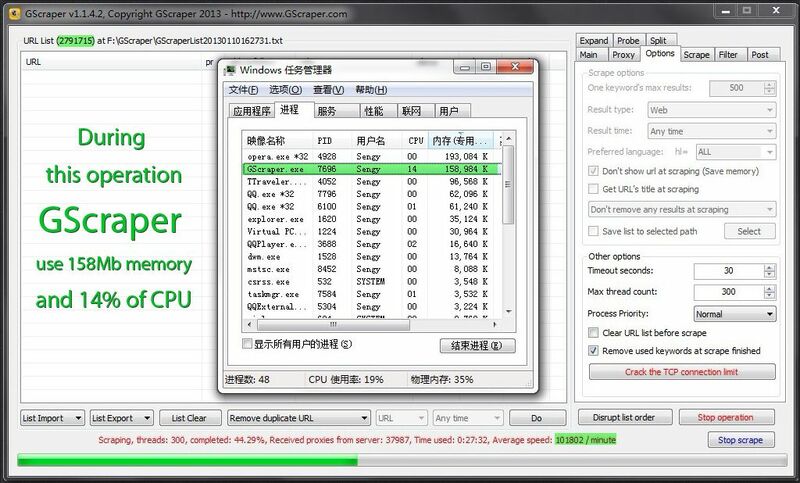 For an SEOer, if to use Scraperbox, it will not only take a long time or money to find proxies, but also it is difficult to operate. 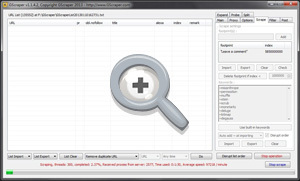 Now GScraper function is more and more friendly and can easy get more and more list. GScraper have the expansion and post function, it is great! And GScraper can listen to users' good advice and after-sales service is also very good. I do believe GScraper will be more and more popular, and eventually become nuclear weapons of SEO industry. Home | Privacy | Terms ©2012-2019 GScraper.com, Designed by Jitesi from China.